It was a record-breaking Sunday. The first item of note was that this was the first sanctioned bout held in our practice space. 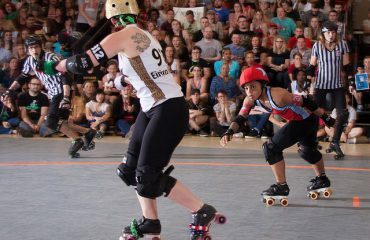 The Dirty South Derby Girls hosted the newly-minted WFTDA league Columbia Quad Squad from nearby South Carolina. The Columbia Quad Squad All-Stars came into the game with a 32-game winning streak to their name. In fact, the last game they lost was way back in 2009 to the Atlanta home team, the Denim Demons….And that was the second record that was broken that day. DSDG pulled out to an early lead and kept the heat on for the entire game. DSDG ended with a solid victory, 155-74.